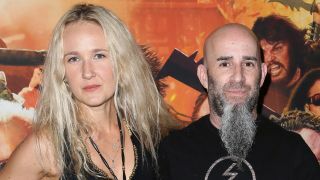 Scott Ian and Pearl Aday's two-year-old son is a big AC/DC fan – and he prefers Bon Scott to Brian Johnson. Possibly the coolest kid in rock, little Revel Young Ian is already a big music fan thanks to his celebrity parents – Anthrax’s Scott Ian and his singer wife Pearl Aday. The couple say their son is a fan of Metallica, The Beatles and AC/DC and that he can already tell the difference between Bon Scott’s voice and that of Brian Johnson. Ian tells Horns Up Rocks: “He knows a lot of the stuff that he hears or sees in the house. But what’s really cool is that he actually recognises and knows the difference between Bon Scott and Brian Johnson, which is pretty cool I think for an almost three-year-old. In the video, Ian and Aday – who is Meat Loaf’s daughter and singer in her own project, Pearl – also discuss being touring musicians and parents.